Follow our step-by-step, photo illustrated instructions to make our version of the old fashioned, A&P Spanish Bar Cake. We’ve stepped back in time to recreate one of your favorite tastes from the past with this very special spice cake recipe. We’ll share the cake recipe, and the frosting recipe, so you can make this wonderful dessert right in your own kitchen. Printable recipe included. Spanish Bar Cake: The old fashioned A&P Spanish Bar Cake type recipe. Welcome to my Spanish Bar Cake journey. I hope you’ll join me on this adventure as we set out to recreate a beloved recipe from the past. I’ve given it my best shot, and look forward to you joining in and sharing your memories, comments, and suggestions. I developed this recipe for the Our State Magazine website a few weeks back. I’ve been contributing recipes to them for several years as you may already know. Many of their readers had made comments about a Spanish Bar Cake that use to be sold at A&P Grocery stores throughout North Carolina years ago. Their comments sparked my interest in finding the recipe, and thus the journey began. There were several recipes on the internet that claimed to be the original, but how can several “different” versions, all be the ONE recipe that made this unique cake? Obviously none of them were, so I took it upon myself to come up with one that might be close to what the cake originally tasted like. Problem was, I had no idea what that taste might be. However, I did have a pretty good source that might could help out. More on that in a moment, let me give you a little background information first. The Atlantic and Pacific Tea Company (A&P) began back in 1859 in New York City, and quickly made a name for itself as an innovator and leader in the grocery industry. Before long, the company even began making its own brand of products, including the beloved Spanish Bar Cake. By the 1930s, there were over 16,000 A&P stores across the country. Sadly, in the 1950’s, A&P lost ground to newer, more modern stores, and eventually closed all its North Carolina locations. Mama shopped the A&P store in our hometown every chance she had back then. She had no choice. Her oldest son, my older brother, worked there and eventually became store manager. He worked with A&P for many years. Older brother said this was one of his favorite desserts when he worked for A&P. He spoke fondly of how he’d grab a soft drink and one of these cakes at break time, and practically eat the whole cake in one sitting. He was quick to recall the look and the taste of the cake, and told me numerous stories about selling the cake over the years he worked with A&P. My first attempt garnered a “6 out of 10” on my older brother’s memory scale. Not bad, but not good enough. He said it should be darker and a little spicier. My second attempt, rated a 7 from older brother. Either he was just being nice, or I was getting a bit closer. I made a few changes, then baked the cake yet again. This time, I entered it into the 2014 North Carolina State Fair. I’d never entered a cake into the fair before, but I just wanted to get an independent, blind taste test, of the recipe itself to see what someone else might think about it. The judges at the fair didn’t know it was an attempt to recreate the A&P cake, to them, it was just a spice cake. At least I might find out if the cake itself had any merit. The recipe below managed to get an “Honorable Mention,” from the State Fair judges. I think that meant that it tied for third place, then after another round of judging someone else took third place, and mine got the Honorable Mention. I would later find out there were 15 entries in the Spice Cake division this year, so being 4th out of 15 isn’t so terribly bad just on the merits of being a spice cake alone. The printable recipe at the bottom will turn out a much darker cake than the one pictured here. I switched the regular cocoa powder I first used, to a Dark Chocolate cocoa powder for the cake I made for the State Fair entry. Of the things my older brother kept mentioning in my first attempts was. 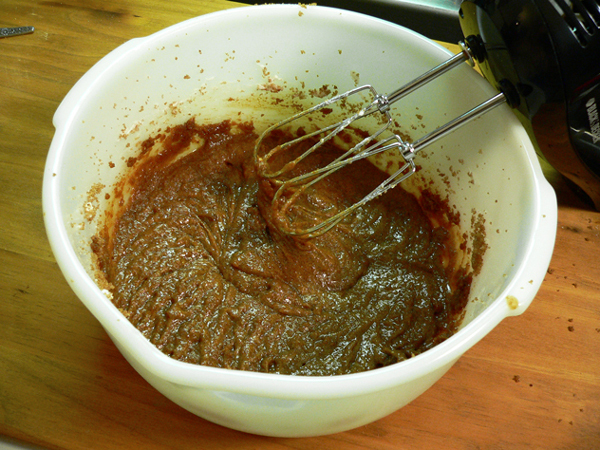 the cake needed to be darker, moist, and a bit more spicy. The printable recipe is the recipe that I used to bake the actual cake that was entered into the State Fair competition. Making the cake by the step-by-step photos is pretty much the same, but follow the printable recipe if you decide to join in on this little journey of ours. If you remember the A&P Spanish Bar Cake, I’m open to your suggestions, and your own memories of it. I know it will be an older generation that will have those memories, so maybe you could ask a parent or older neighbor if they know about and recall the cake. Any information will be helpful. I have found that A&P still makes a fruitcake that was made years ago, but I haven’t found where they still make the Spanish Bar Cake. I could pick up the phone and call and ask I guess, but I haven’t done that as of yet. Maybe I need to do so. So, if you’re ready to step back in time a bit, let’s get in the kitchen and sling some flour. Ready to give it a try? Alright then… Let’s Get Cooking!!! 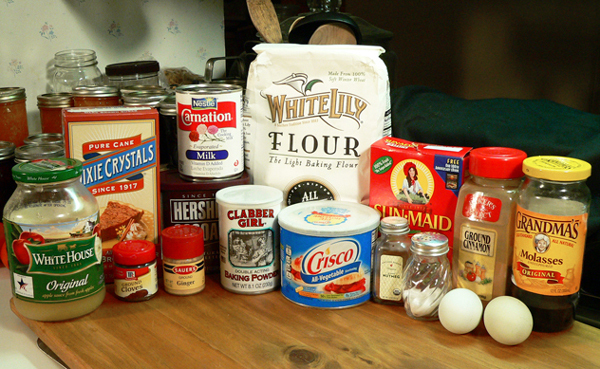 A&P Spanish Bar Cake recipe: You’ll need these ingredients. 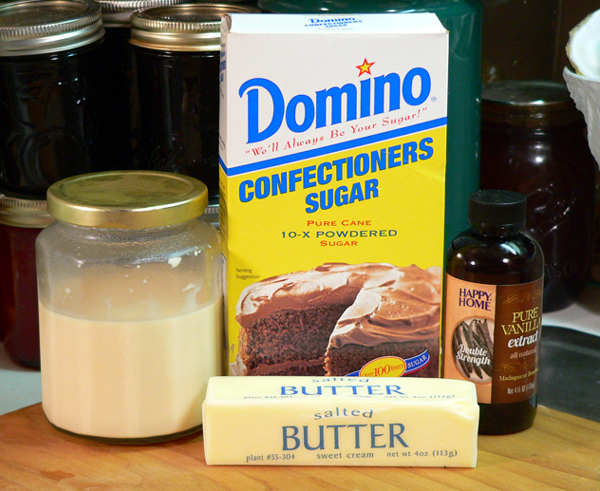 We’ve also got the ingredients for making the frosting for this cake, further down in this post. Plump up those Raisins: Before we start making the batter, let’s plump up those raisins. Bring about 2 cups of water to a slight boil, then REMOVE from heat. Drop in the raisins, and just let them sit while you make the batter. This will plump them up, and make for a better cake. You’ll need two level cups of All-Purpose Flour to begin the batter. 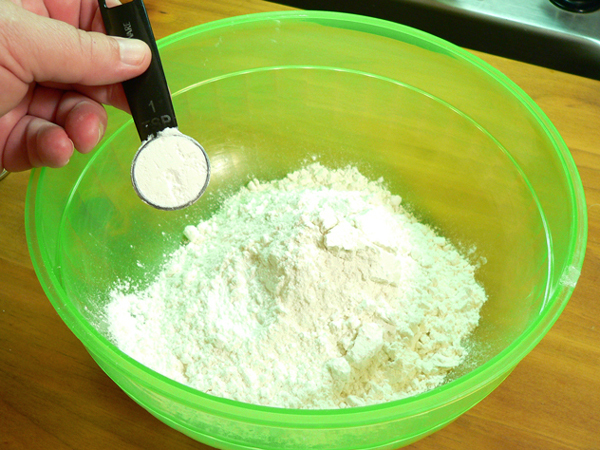 Measure the flour out into a large mixing bowl. I used Hershey’s regular cocoa for the first recipe, which I took these pictures of. After making the cake, older brother told me that he remembered it being much darker in color, almost black. I switched to the Dark Chocolate cocoa for the printable recipe, and for the cake that I entered into the 2014 North Carolina State Fair. 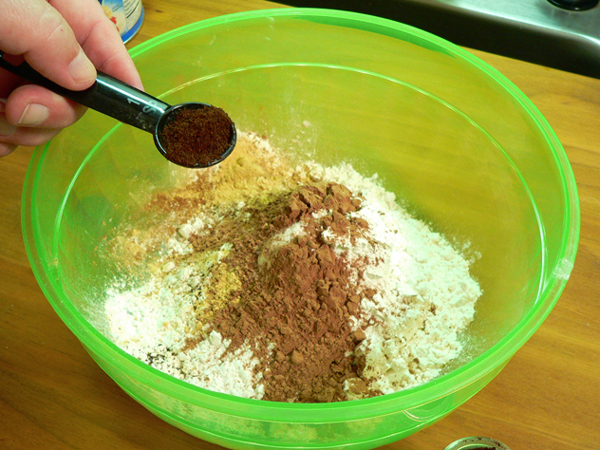 Use a whisk to mix all of the spices and flour together. 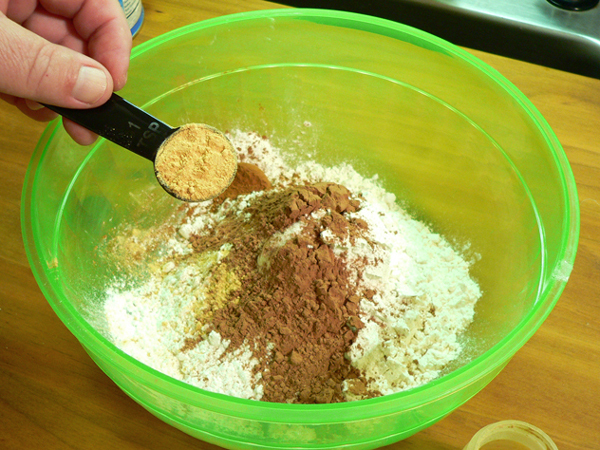 Now, you’ll need to sift this spice and flour mixture three times. I used a sheet of parchment paper in this step. 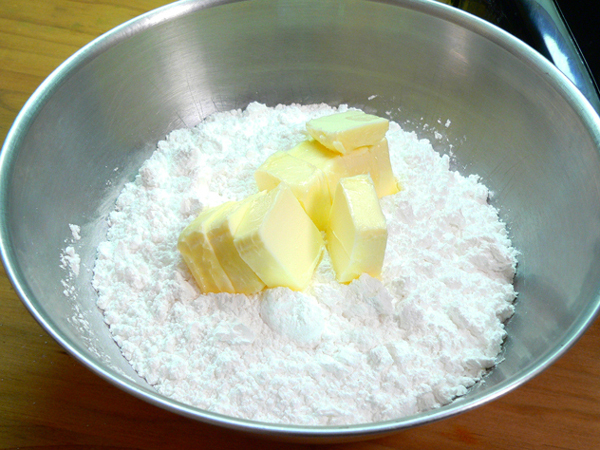 After sifting the flour into my bowl, I’d dump it out on the sheet of parchment, then place it back into the sifter. The parchment let me grab up the sides so I could easily pour the flour back into the sifter. Of course, two bowls will work, so use what you have. 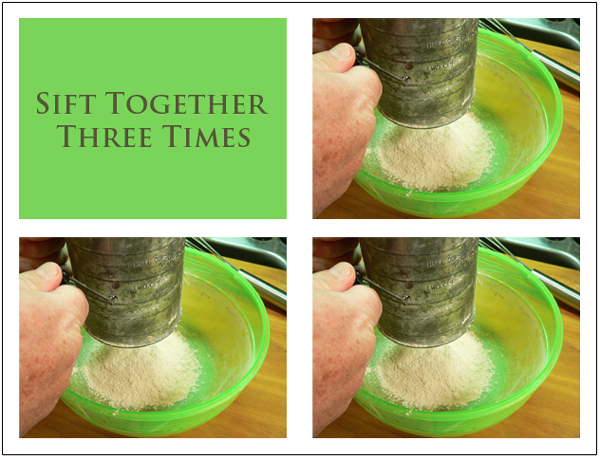 Once you’ve sifted it three times, set it aside until later. 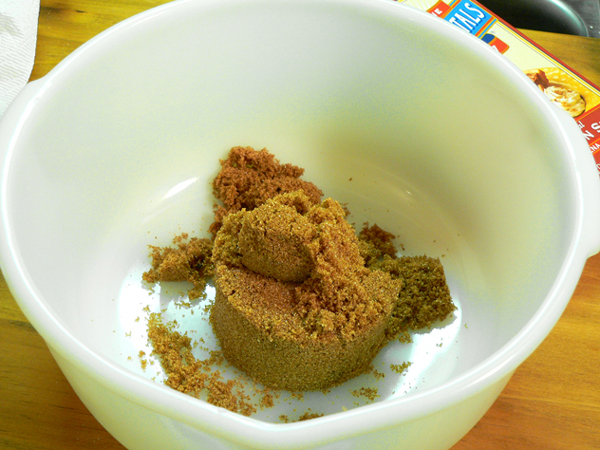 Using another large mixing bowl, add the Brown Sugar. 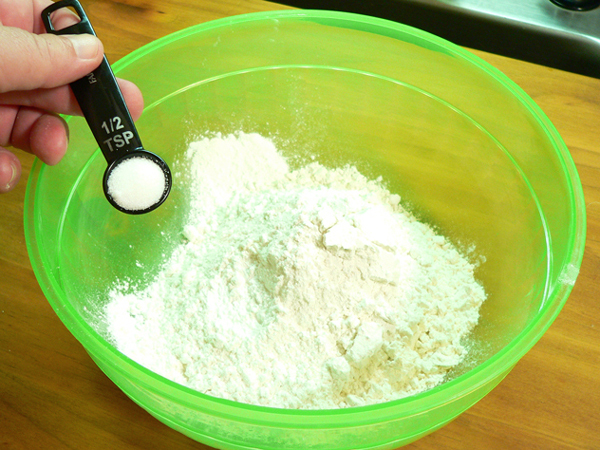 Using a hand mixer on Low speed, combine the shortening and sugar together. 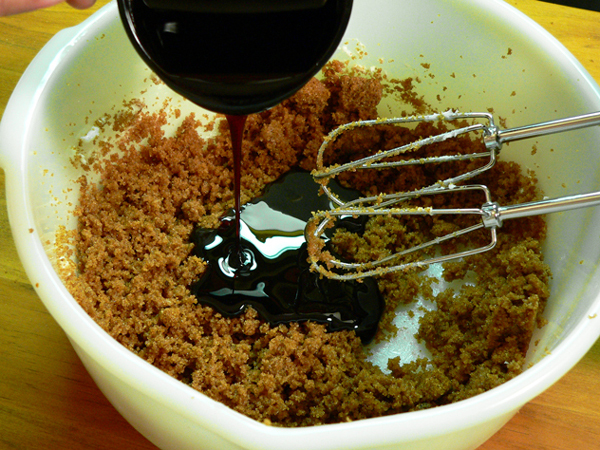 Mix the molasses into the sugar mixture. Add the two whole Eggs. 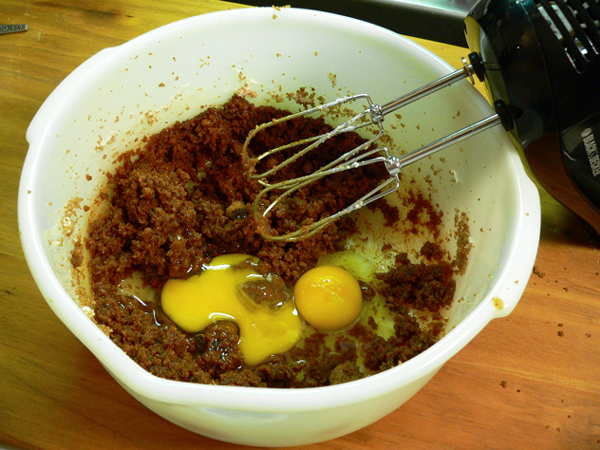 Mix the eggs into the mixture, just until they are combined in good. Still using the hand mixer, mix the milk just until it’s combined with the rest of the wet ingredients. Mix the applesauce in, just until combined. Now we’re going to mix the dry ingredients into the wet ingredients. This is done in three increments. 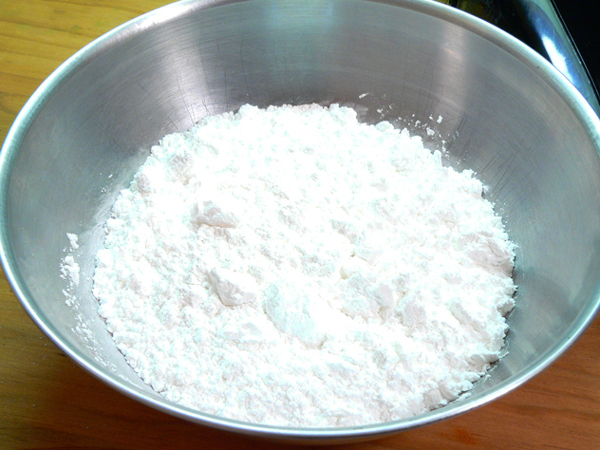 Add one third of the flour mixture into the bowl. 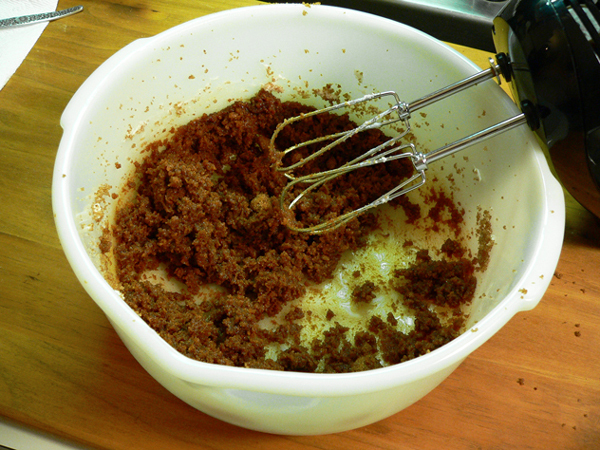 Using the hand mixer, mix this together just until it’s all combined. 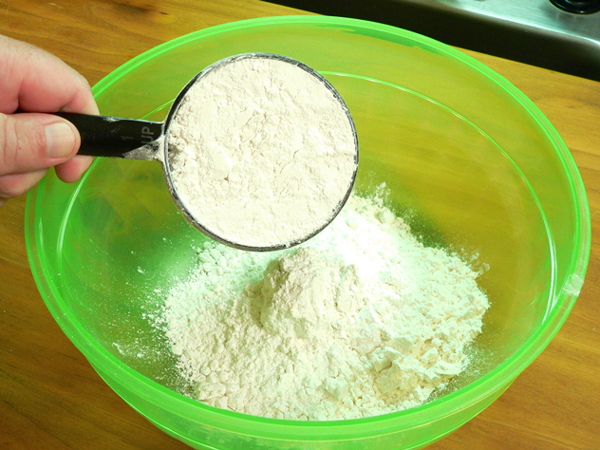 Add another third of the flour into the bowl and mix again. Finally, add the remaining flour into the batter, mix it just until combined, scraping down the side of the bowl as needed. Do not over beat the batter. The batter should be fairly thick at this point. Drain the raisins in a colander. 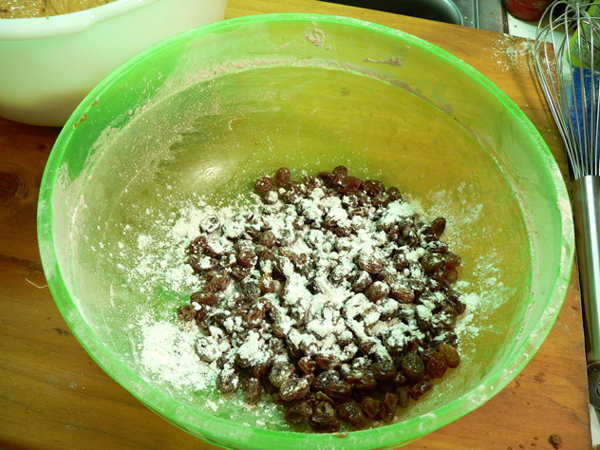 Sprinkle about a Tablespoon of All-Purpose Flour over the drained raisins. 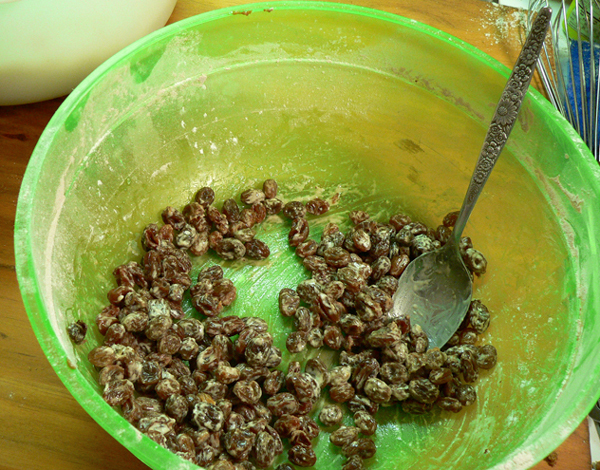 Stir the raisins around with a spoon, until they are all coated with flour. This is suppose to keep all the raisins from just sinking to the bottom once you place the batter into the baking pan. 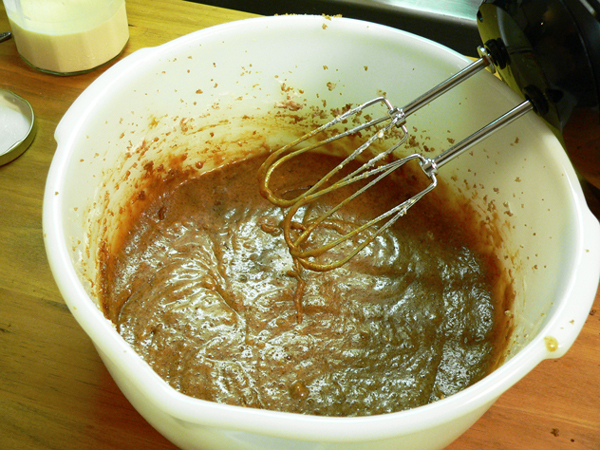 Add the Raisins to the batter. 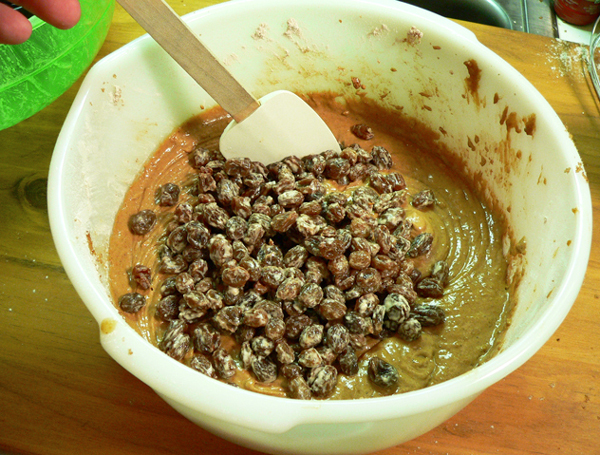 Using a large spoon or spatula, gently fold the raisins into the batter mixture. Just a quick swirl or two is about all you’ll need. 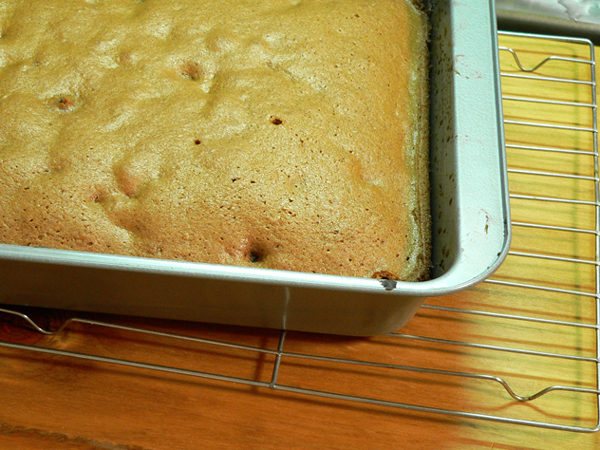 Prepare your baking pan: I used one of the canned sprays that contains flour to coat the inside of this 9×13 sheet cake pan. If you don’t have a spray with flour, coat the inside of the pan with shortening, then sprinkle in some flour. Roll the flour around inside the pan until you’ve got the bottom, corners, and edges fully coated. 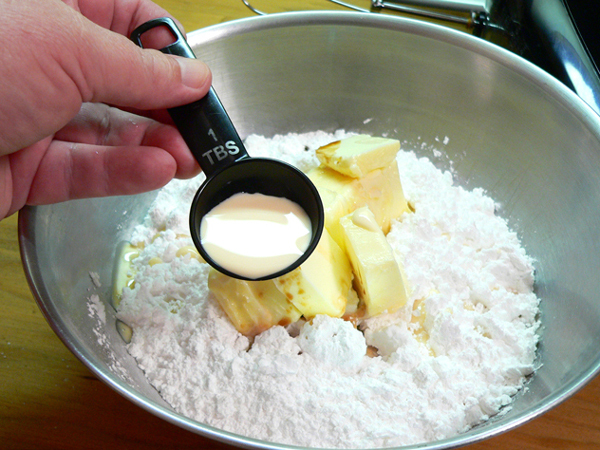 Spoon the batter into the coated pan. As mentioned, the batter is a bit on the thick side. I used a spatula to spread the batter out into the corners of the pan so it would be evenly distributed inside the pan. Work from the center, and spread the batter out into all corners. I also lifted the pan about 2 inches off the counter, then dropped it, to force any air bubbles up to the top. Place the pan in your preheated oven. Bake it on 350 degrees for about 30-35 minutes, or until done. Oven’s will vary, so keep a close check on it. The cake is done once it starts to pull away from the sides of the pan, and when a wooden toothpick inserted into the middle of the cake, pulls out clean. When the cake is done, remove the pan from the oven and place it on a wire rack. Let the cake cool completely before you try to remove it. You could also just add the icing to the top of the cooled cake and serve it directly from the pan. I wanted to make my cake look more like the original, so I planned to remove it from the pan. To do this, I cut a piece of cardboard just smaller than the inside dimensions of the pan and placed this on top of the cake once it had cooled. Placing one hand on the cardboard, I flipped it all over and removed the layer intact. Next, I split the cake in half and started building up the layer cake, frosting the middle, then the top. While the cake is cooling, lets go ahead and make the icing for it. Spanish Bar Cake Frosting: You’ll need these ingredients. I’m using some left over Evaporated Milk that I had. Regular milk will work just as well for this part. It’s pretty much a basic Buttercream frosting. The butter needs to be softened to room temperature for best results. Start out by adding three Tablespoons of Milk. You’ll probably need to add a bit more, but do this gradually to work the frosting up to your desired consistency. I ended up using 5 Tablespoons both times I’ve made this frosting. You might need more, or even less. You’ll want the frosting to be a bit on the thick side, so be careful adding more of the milk as you go. If you’re making two layers from the one sheet cake layer, spread a good amount of frosting in between the layers, then frost the top. You’ll probably still have more frosting than you really need this way. I ended up with about half a cup leftover, and I thought I was spreading it pretty thick. Follow our step-by-step, photo illustrated instructions to make our version of the old fashioned, A&P Spanish Bar Cake. 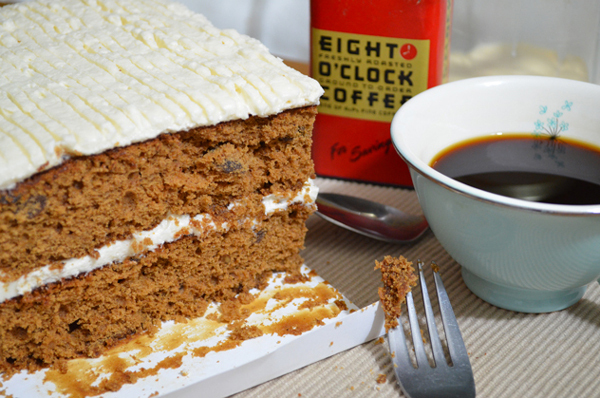 We’ve stepped back in time to recreate one of your favorite tastes from the past with this very special spice cake recipe. We’ll share the cake recipe, and the frosting recipe, so you can make this wonderful dessert right in your own kitchen. 1 cup Raisins, soaked in warm water until plumped, then drained. 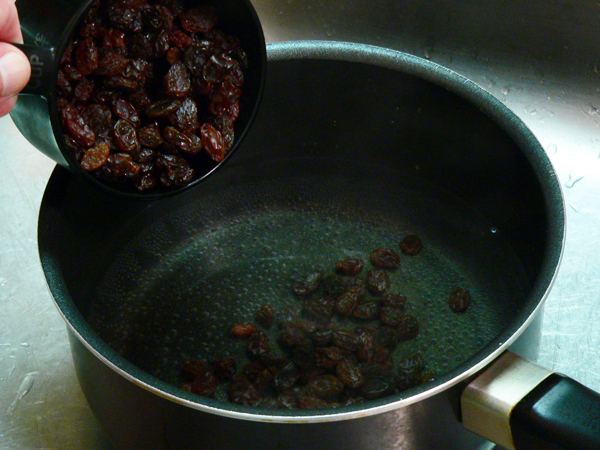 Soak raisins in hot water until plump, drain. 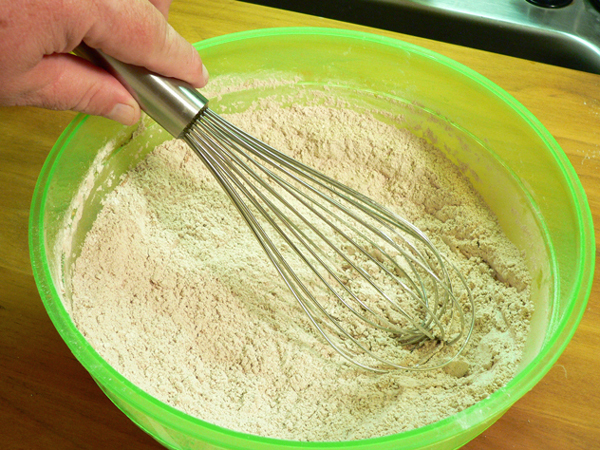 Whisk dry ingredients well to combine. 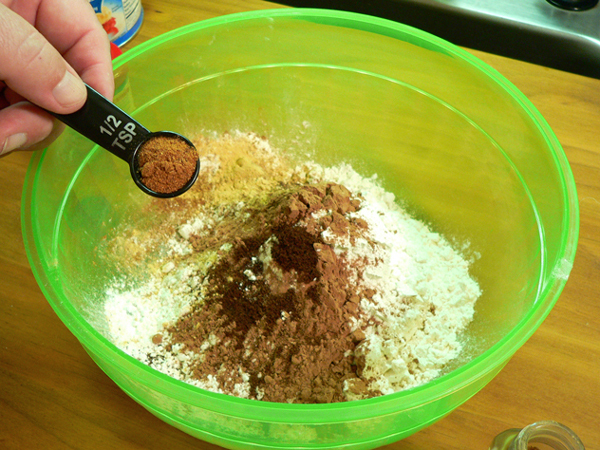 SIFT the dry ingredients mixture three times, set aside. 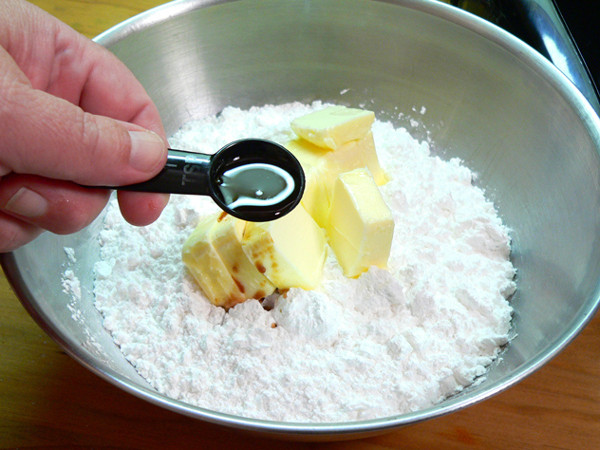 Place shortening and sugar in a large mixing bowl. 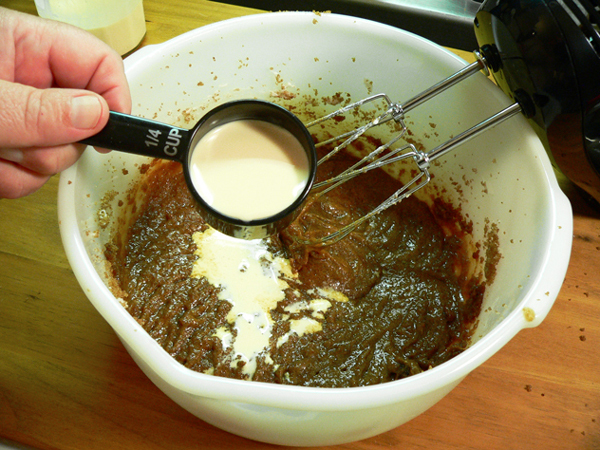 Using a hand mixer, on low speed, cream the shortening and sugar together. Add Molasses, mix until combined. Add eggs. Mix just enough to incorporate into mixture. 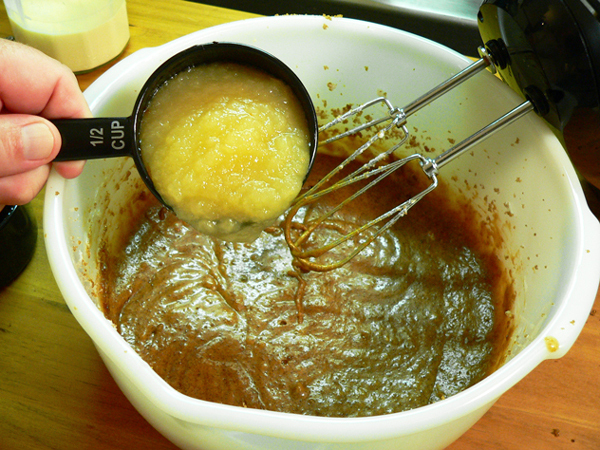 Add Applesauce, mix again, just until combined. 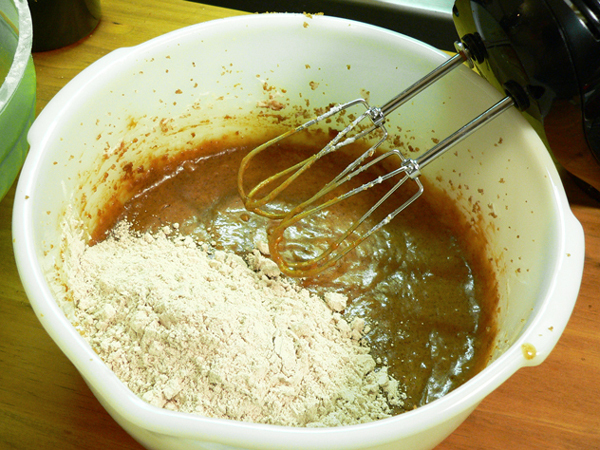 Add flour mixture, to wet mixture, in three additions, stirring after each to combine. 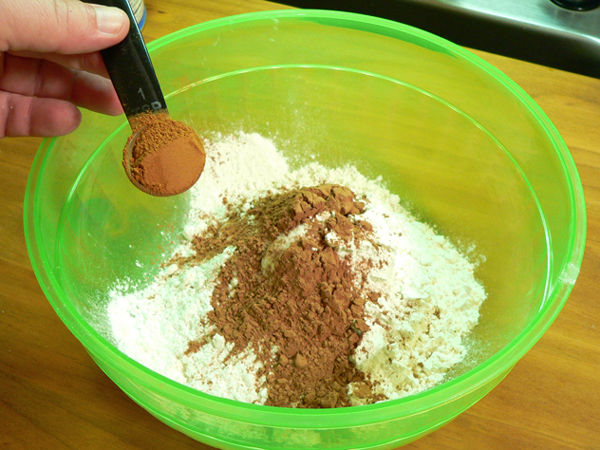 Prepare your baking pan by coating with shortening and flour, or use a baking spray with flour. 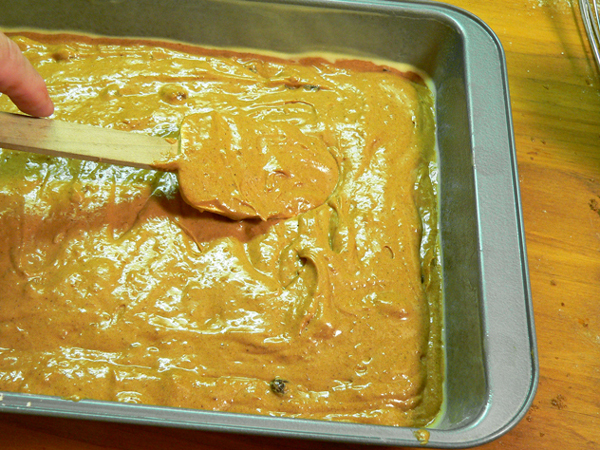 Batter will be thick, so use a spoon to spread it out evenly in the baking pan. Bake at 350 degrees for 30-35 minutes, or until done. Remove cake from oven, and place on a wire rack to cool. Frost as desired with frosting recipe included here. Slice the sheet cake in half, and stack into layers, placing frosting in middle and on top. Use the tines of a fork to place a design on the top layer like the original A&P Spanish Bar Cake had. Your Comments: Do you remember the original A&P Spanish Bar Cake? Do you think our recipe comes even close to it? I’d love to hear your comments about it. It will only take a minute or two for you to share your thoughts with us in the Comments section below. Please note that all of our Comments are moderated. That just means that I personally read each and every one of them before they are approved for our family friendly site here on the Internet. Your comment will not appear immediately, but I’ll do my best to get it posted online as soon as possible. Thank you in advance. I am super excited to try this recipe!! I haven’t had Spanish Bar Cake in years and have always wanted to recreate it. I wish that I could share it on Facebook! My grandmother always served this cake at Christmas time and I can’t wait to try it. From what I have read of your ingredients verses the other that sounded like it had some of the right ingredients. You are right about the molasses and the shortening and all of your other ingredients but maybe add more applesauce to the cake and put cream cheese in your icing. Cream cheese is what gave firmness to the icing. I am going to try it that way to see. Reading all these comments, I began trying to remember who else made the Spanish Bar Cake for commercial sales? I grew up in a small eastern North Carolina town and we did not have an A&P, only small mom and pop owned grocery stores. I worked in one of them while in high school and we sold somebody’s Spanish Bar cake which we “bag boys” ate on a regular basis. That was early to mid 1960s. The cakes were 4-5 inches wide and, maybe, 10 inches long. They were dark, had white icing, sat on a red corrugated looking paper and wrapped in cellophane. The store was a big seller of those to-die-for Duchess pies out of Charlotte so I’m wondering if they might have produced the Spanish Bar Cake…….or perhaps Merita? This is the Third Recipe I’ve tried for Spanish Bar Cake, and we all agreed, it is the closest to the original. I did not “Plump” the Raisin, just wet them, as they would’ve been more like grapes than Raisins in the finished product. This is a “Heavy” cake, with the texture of pound cake which seems to follow the original. Lightly grease one 13” X 9” cake pan or 2 loaf pans. 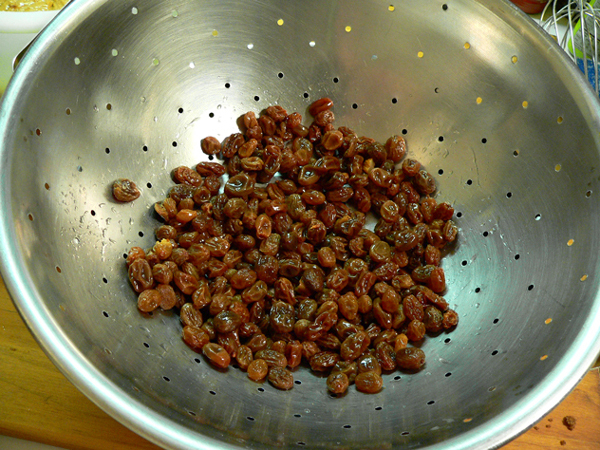 Cook raisins and water for 10 minutes over medium heat. Stir in the shortening. Remove from heat and let mixture cool. the cooled raisin mixture and blend well. Stir in the beaten eggs. Add the chopped nuts (if desired). Pour batter into prepared pan. Bake at 350 degrees F (175 degrees C) for 35 minutes, OR, until center springs back when lightly touched. When cake is cool, spread your favorite vanilla frosting on top. Steve,I grew up in Chicago and my mom would buy a Spanish bar cake each week we went shopping. She should have bought 2 each time. There were 10 of us kids and 2 parents. Glad some of them didn’t care for it, otherwise the slices would have been paper thin. I wish I could find it in a store now. It was my favorite cake. I always requested it for my birthday cake. So my mom would spread the frosting all together on 3 of the cakes, it looked like a big square cake. Then she would write happy birthday on it. Those were good times. Dear Steve; If a person follows your delicious recipe without reading the story, he/she will grease and flour a loaf pan instead of a 9 x 13 sheet pan per your instructions. Maybe it would help if the recipe instructions could be corrected. As for me, I always read your stories. I enjoy them so much. As a special holiday request could you locate the recipe for a real Devil’s Food Cake? It is my cousin’s favorite. All we can remember is that it had a reddish hue and white frosting; it is not a red velvet cake. Thank you!!! Ok, I have been craving this cake for the last year or more and took to the Internet to see where it might lead. Thus here I am! I grew up in Ontario and my Mom also used to buy this cake at Doninion which was under the A&P banner. We loved it! Can’t wait to try your recipe. Another website printed a similar recipe and a gentleman came on very firmly stating that recipe would not tastes like the bar cake because it was the wrong recipe. He posted a solid recipe and an older gentleman backed up his statement…saying he had baked the cake for A&P and they were correct. Here is his recipe. I would love to see if someone can try it and compare. Cream the shortening, sugar and egg, blend in molasses and add the boiling water. 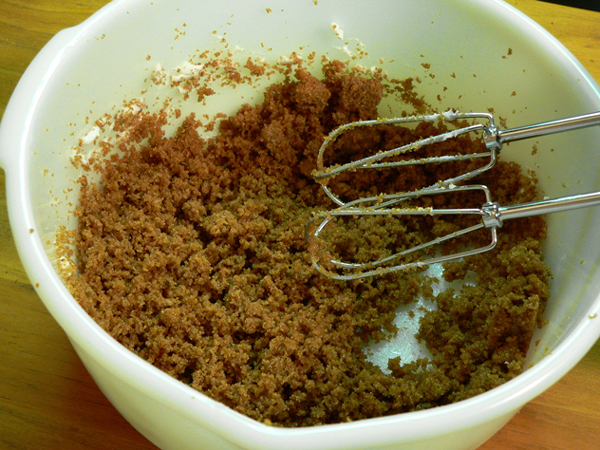 Sift together the remaining ingredients except the raisins and stir it into the egg mixture. Fold in the raisins. 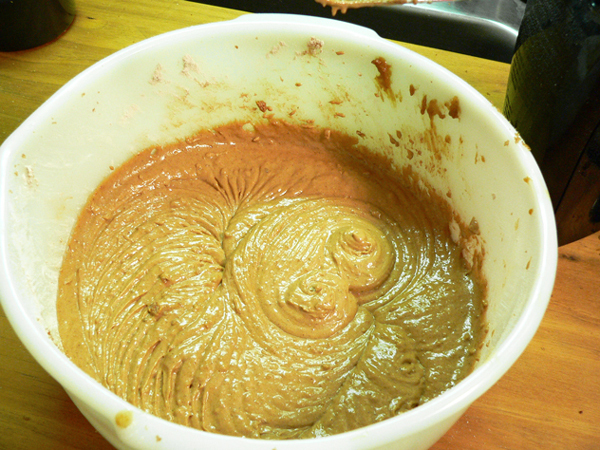 Divide the batter equally between two greased and floured loaf pans. Bake in a 325oF oven for 30 to 40 minutes, until a toothpick inserted in the center of each cake comes out clean. Cool the cakes in the pans for 5 minutes, then remove them from the pans and cool completely on a wire rack. Cut each cake in half horizontally and frost the top and center ONLY with a frosting made with 4 cups confectioner’s sugar, 1 cup of shortening, 1 Tbs water and 1 tsp clear vanilla extract. I made this one and it is spot on. The recipe given by Steve is not a BAR cake as we knew them and A&P did not use buttercream icing. 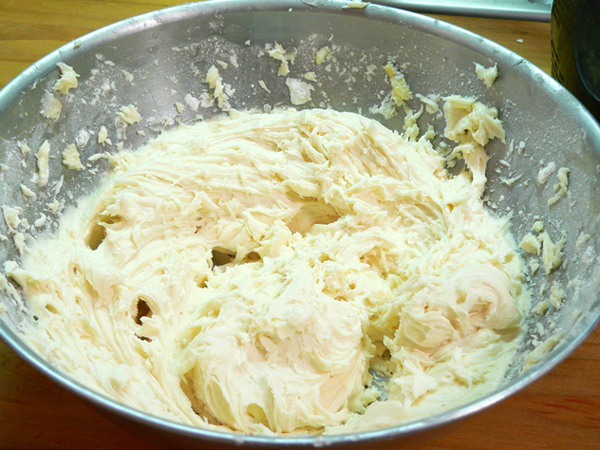 Shortening was used to stabilse the icing. My Mum bought one each Friday and IF it lasted until Sunday, we did not refrigerate. Buttercream frosting would wilt. B) the icing does not have cream cheese or butter, it also should be made with shortening. Thanks for posting, I’ll try this one next. My husband remembered this cake fondly from his youth and printed the directions for me. It was not part of my youth as there was no A&P in my home town. I finally made it tonight and followed the directions to the letter, including “grease and flour a loaf pan”. I took that to be a bread loaf pan and when the cake was still not baked after 45 minutes, looked it up on the internet to see the pictures. Turns out you meant a sheet cake pan, as shown in the picture and mentioned in the bottom notes. Sorry I missed that but I followed the previous direction. I’m not sure this recipe will turn out too well in a loaf pan (it’s still cooling) but it does smell wonderful! You may want to change “loaf pan” to sheet pan in your directions. I’ll try it again with the proper cake pan as it seems to be a wonderful spice cake recipe! Hey, Steve! I’m not from NC but we had A&P in Ohio in Ohio also. This may be a long shot, but every now and again our Nickles Bakery Outlet in Ohio sells a spanish spice bar cake that comes darn close to A&P’s. Perhaps if you contacted Nickles Bakery they could help you out? 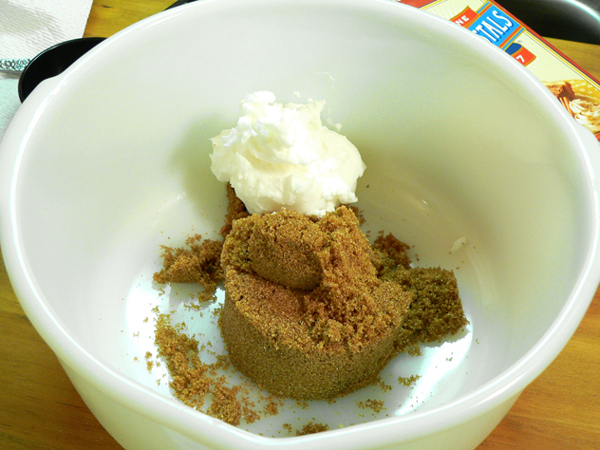 I’m trying to recreate with a good spice cake mix, but I know it won’t come close. Keep up the good work!! the AP were all over especially in the north and into eastern Canada. running across the main road to get bread and milk was my chore and picking up a pie or cake, especially when they were marked down was my job as a kid, and my favorite was the spanish bar cake. Steve, I feel like we grow up in the same family and I love, love, love your site, stories and recipes. So many memories. I can’t wait to try some of your recipes, especially this one! Thanks so much! A few months ago I saw your comments in the Our State magazine about the A&Ps Spanish Bar Cake. I remember that cake fondly because my mother bought it frequently. Today I made your clone of the cake and found it to be good, but not totally accurate. There seemed to be an off-taste I could not identify which did not appear in the original. Also, some of your commenters had mentioned that a cream cheese frosting might be appropriate, and they may be correct. Nevertheless, you deserve a gold star for your efforts–you said it was a work-in-progress and I look forward to trying your next version. Although I have lived in Florida for many years, I grew up in a small town near Charlotte and return to N. C. frequently. Some of the ladies of the town made what they called a Canadian War Cake (WW I or WW II ??) which had no eggs, presumably because they were scarce during the war. That cake had some similarities to the A&P cake, although it had a chocolate icing rather than a white one. Some similarities: ginger, cinnamon, brown sugar, raisins, and nutmeg, although not all quantities are the same. Some differences: The Canadian War cake had no cocoa, cloves, molasses, applesauce, eggs, however it did have walnuts or pecans which were not present in the A&P cake. I am beginning to wonder if the off-taste I mentioned is the molasses. Anyway, I believe the taste of the Canadian War cake was fairly close to the taste of the Spanish Bar cake. If you would like to review the Canadian War cake recipe for comparisons which may assist you in your next version of the Spanish Bar Cake, just let me know how I might properly send it to you. Hi Gene, Thank you for taking the time to share your memories and comments about the Spanish Bar Cake recipe. As I mentioned, it was, and still is a work in progress. I had hoped some of the folks that remembered it would share more insight, and I’ve picked up a few pointers. I made several of the cakes back when I was attempting the recipe, but haven’t made one recently. Your comments about the Canadian War Cake sound of interest. I’ve heard of a crazy cake recipe without eggs as well, but haven’t tried it. I’d love to get a recipe if you have one you’re willing to share. Send me an email via the CONTACT form, and I’ll reply with an email address for you to use. Thank you in advance. I don’t remember the cake well enough to remember what it tastes like, so I’m counting on readers for help. Thank you again. Hi Steve! I must be as slow as the molasses in your recipe! I’m cleaning up some old emails and found your newsletter from back in November hiding amongst some unread ones. So I’m just reading this about the A&P Spice cake. I remember eating this!! My mom must have gotten it when she shopped at our local A&P which I remember being in many times. And if I tasted your recipe I’m sure it would all come back. I’m forwarding this post to my mom who’s living at my sister’s house in SC for the next 3 months. I’m sure she will remember the Spice Cake well. Thanks for the memories! And, as usual, I always enjoy your posts, recipes, and especially the newsletters. I just don’t always take time to comment. Thanks for all you do! Thank you so much for these great recipes and stories. I just stumbled on your blog today and am really enjoying it. So many food blogs seem to be trying to impress and don’t connect to family or tradition. Yours is authentic and from the heart. OMG Steve! I am typing this through my tears!! This was my favorite of all cakes. My Mom shopped at A & P and brought this home every time she shopped there. It was our family’s favorite. I have been searching for this cake and/or a recipe for YEARS. I had even forgotten the name of it. My Mom passed away November 26, 2013 at 91 years old and I would have LOVED to make this cake for her. I cannot wait to make this. I just can’t tell you how much this means to me. I will be 66 years old Nov 24th and this recipe brings back SOOOO many wonderful memories. Thank you so much. I stumbled across your website via Facebook and can’t take my eyes off of it. Love to cook all types of food. Live up north in Illinois all my life. But surely appreciate delicious food. I do have a tip for you that may help. 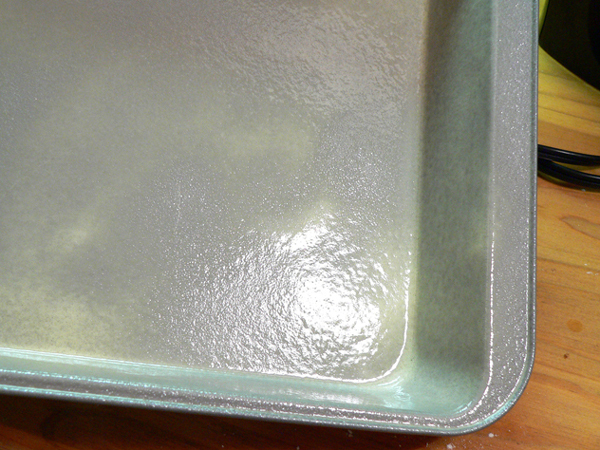 Line your 9 X 12 pan with a strip of aluminum foil that overlaps the ends of the pan. Spray it or grease it well. When the cake is done and cooled, simply loosen it from the sides and lift it out. Should make removing it from the pan a lot easier. I do this with brownies that I plan to present as a dessert dish. Thank you for your birthday wishes. Merry Christmas to you and yours from me and mine. I almost forgot about scraping the paper with a fork til it was clean. It was the best. We would do it with the pound cake wrapper too. I remember this cake so well, was my favorite as a child. I can remember wanting one of these everytime we went to the store. I even requested this for my birthday which was weird I guess for a small child. Thanks for the pleasant memories. My dad owned the only grocery store and gas station in the small, rural NC area I grew up in, and we had Merita bread and cakes. 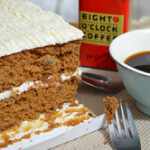 But I definitely remember a spice bar cake just like this one!! It was one of my favorites. This would have been late 1960s-1970s. I so enjoy your blog and look forward to trying this recipe! Recently, my wife and I shopped for coffee and I was mentioning that I missed the aroma of the grinding of coffee beans in the old A&P Stores. When I accompanied my parents grocery shopping, I would always head for the coffee isle and just hope someone would come by to grind coffee. The picture of the Eight O’Clock brand is great. THANK YOU SO MUCH FOR THIS TRIP BACK IN TIME!! My Mom bought one of these cakes every single week at A&P along with the A&P coffee. She and my dad would eat it every morning with their coffee and then another slice at night after dinner. I have looked for them several times since my Mom passed but didn’t realize they were only from A&P. It is like all the other things we remember from our childhood, they are often gone but not forgotten. I will save this recipe and make it on my Mom’s birthday in remembrance on her! Love your site. I remember a lot of your recipes, brings back childhood memories. I too, wish heaven had a TELEPHONE.